I'm Excited For You To Meet My Friend, Indiana! 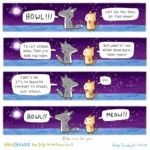 Howl! Why Do You Howl At The Moon? To Let Others..